I am not an educational style purist. I usually describe my homeschooling style as “classically eclectic with a Charlotte Mason twist.” I whole-heartedly believe that we can learn something from any homeschooling method. Then, we can take the pieces that are meaningful to us and make sense for our families and blend them to create our own unique philosophy of education. No matter which method you prefer, there are three unschooling philosophies that any homeschooling style can embrace. Strewing is one of my favorite unschooling concepts and one that all homeschooling families should embrace. Strewing means to scatter or spread, and the idea is that you fill your child’s environment with things that have the potential to captivate him or spark his interest. If you have a child who is into dinosaurs, maybe you pick up some interesting books about dinosaurs at the used bookstore. Perhaps you leave an abandoned bird nest lying about for your kids to notice. Maybe you pick up an old TV at a yard sale for your tinkerer to take apart. Open-ended play items can be great for strewing, too. Try craft supplies, pattern blocks, magnets, or sensory boxes. Strewing doesn’t have to be limited to physical items in your home. It can also apply to opportunities. Perhaps you purposely drive by a construction site while you’re out running errands. Maybe you spend an afternoon exploring thrift or antique stores or take a walk in the woods with no particular goal in mind. The important thing to remember about strewing is that is should be done with the expectation of possibly engaging your child or sparking her creativity. If she doesn’t “take the bait,” so to speak, that’s okay. Don’t force the issue. The idea is to create a learning-rich environment that invites – not forces – your child to explore and dig deeper as he chases his own rabbit trails. 2. Children are naturally curious beings. Unschooling families espouse the view the children are naturally curious and will explore and learn without having their education directed by someone else. That’s why unschooling is often called natural learning, child-led learning, or delight-directed learning. 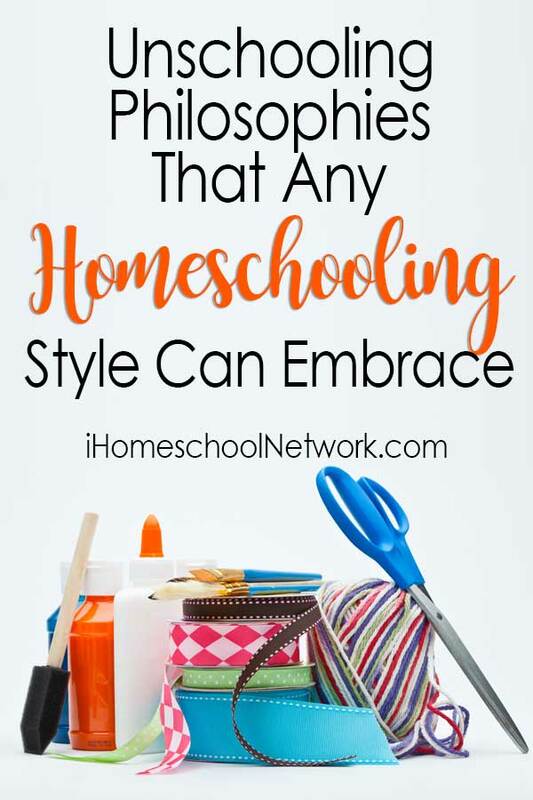 Although you may not be ready to hand over the educational reins to your child completely, there are many ways that all homeschooling families can embrace this philosophy. One simple way is through unit studies. Topical studies are a fantastic way to capitalize on your student’s interest while still maintaining a sense of control over the framework. Another option is to include two or three elective studies that are purely interest-led. Whatever your child’s interest – photography, cooking, LEGO, computer coding – set aside time each day for him to pursue it. And, let him dig into it however he likes. If he asks for your help, provide it, but let him take ownership of this part of his education. 3. Learning happens all the time. Unschoolers don’t classify activities as educational or not educational. All learning counts. Sometimes the best learning happens when we put aside the lesson plans. No matter what your homeschooling style, embrace the idea that learning happens all the time and it all counts. When your child gets caught up on a rabbit trail, don’t despair that you’ve gotten behind or all the boxes didn’t get checked. Instead, consider all that she learned. Journal it if you need to. Jot it down in your lesson planner if that makes you feel better. Translate it to educationese if you must, but don’t label it as something that doesn’t count. Learn to recognize the educational value of the everyday moments in your child’s life, and embrace those moments as thoroughly as the ones spent at the school table. You may not be ready to become a full-fledged unschooling family, but these three unschooling philosophies are some that we can all embrace no matter which homeschooling method we prefer.